If your company is thinking about launching a mobile application, it might want to have a starting price of free – at least if it wants to have a better chance of being downloaded. 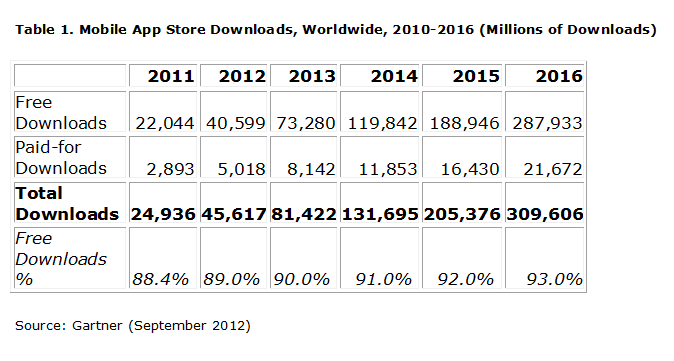 This is because a recent study from Gartner reveals that worldwide mobile app downloads are expected to surpass 45.6 billion in 2012, however, free apps will make up 40.1 billion of those downloads – meaning that free apps are predicted to account for 89 percent of total app downloads in 2012. "In terms of the apps that consumers are buying, 90 percent of the paid-for downloads cost less than $3 each," said Sandy Shen, Research Director at Gartner. "Similar to free apps, lower-priced apps will drive the majority of downloads. Apps between 99 cents and $2.99 will account for 87.5 percent of paid-for downloads in 2012, and 96 percent by 2016." Nevertheless, developers can still monetize their apps by using an in-app purchase model. This is because consumers are more likely to download a free app and decide to spend money on in-app purchases if they receive a good user experience. In fact, Gartner’s study predicts that the number of downloads featuring in-app purchases will increase from 5 percent of total downloads in 2011 to 30 percent in 2016, which will lead to in-app purchases driving 41 percent of app store revenue by 2016. But for those who need further proof that mobile has already arrived as a major player in the tech industry, the study also reveals that Apple’s App Store is expected to have more than 21 billion downloads in 2012 – which is a 74 percent increase compared to 2011. But it is also important to note that Gartner analysts claim that aside from major global app stores, such as Apple's App Store and Google Play, some third-party stores are gaining steam by using their brands to attract users or take advantage of the lack of dominant players in some markets. "Amazon has appealed to users with its strong brand, global presence and a good selection of high-quality content while Facebook's recently launched App Center — supporting both mobile devices and desktops — will become a powerful competitor due to its strong brand and leading position in social networking and gaming," said Shen. "In China, there is a boom market of independent Android stores, due to the lack of presence of Google Play and 'weak' stores from CSPs. We expect to see more new entrants to the market, aiming to deepen relationships with their customers and/or to capture some of this growth market." While only time will tell which apps, brands and stores will rise to the top of the Mobile World, one thing is for certain – no price beats free.